This can be done with ejector pin type piezoelectric cavity pressure sensors. Instead of measuring the pressure inside the cavity you can reset the zero after the injection mold opens (and before the part ejects) and then measure the amount of ejection force. If you are looking for release properties, it is very cumbersome to experimentally determine the adhesion of a particular polymer and its processing parameters. However, the surface tension of the metal material can be found in literature or by experimentation by measure the surface tension via contact angle measurements. You would need equipment to measure the contact angle which is usually completed with a water drop test and subsequent system to measure the contact angle of the material. As an example, I made flat ceramic mold surfaces out of Zirconia which is almost impossible to make anything stick to it. The release characteristics are intrinsic to its properties. Other methods of coatings such as Teflon impregnated aluminum is a very good choice for thermoforming to improve release and reduce adhesion. It depends on if you are looking for a specific material/ tooling choice or if you are looking to asses multiple materials and tooling surfaces for quantitative analysis. Another method could be by utilizing a peel test measuring the force required to separate the polymer from the surface of a prepared sample. For manufacturing also other "sticking" phenomena will be important: most common problem can be vacuum in the cavity, while the core is well vented by all ejector pins and inserts. When using an ejector pin to determine adhesion, be aware of the dynamics of the ejection process, the possible pulling of vacuum on the pin and deformation of material surface at release (notch-effect). These effects can give quite a complex release force graph. COF also can vary widely with mold temperature and the pre-heating of the sheet prior to injection molding. 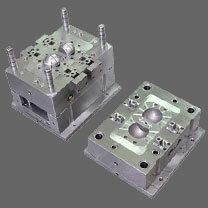 Also, no mold surface should be smooth, and the RMS or roughness chosen can make huge differences. Finally, I've seen the same mold used on different resins - e.g., ABS vs. PP-based TPO resins. Each had to be taylored with the proper release. This is done anyway for extrusion purposes, but subtle shifts in mold release additives for the sheet extrusion step can affect thermoform mold release as well. A simple ladder experiment would help, or you can design an injection mold with many different RMS finishes too and do a full designed experiment. This would include sheet temperature going into the thermoformer as well as heat dwell time. Dwell and temp affect the rate the mold release can bloom to the sheet surface, which affects release. However, having written all this, I'd look at the RMS finish on the injection mold first, and not all methods of roughening the mold surface are equal!